Until last year, a few very lucky, very serious foodies were making the trek to a small village of Roses, Spain, a hundred miles from Barcelona to visit the restaurant considered the finest in the world–El Bulli. Lucky, because it was only open 6 months a year, and in those six months could serve approximately 8,000 meals. For which there were 2,000,000 reservation requests. For the chance to spend €350 per person, plus wine, on a 35 course extravaganza of culinary creativity from the mind of Ferran Adria, considered the world’s premier chef and the high priest at the altar of molecular gastronomy. Last night we went into the City to the Opera Plaza Cinema to see a documentary on El Bulli, aptly titled El Bulli, with our friends Harry and Michael and BJ. Since Michael is a documentary filmmaker, we got some interesting viewpoints, too. The movie follows Adria and his crew through 2008, beginning with the off-season months they spend in Barcelona creating, testing and inventing new dishes. The concepts of molecular gastronomy involve using different processes, methods, products and chemistry to create tastes and sensations that are completely new, that cross the line from cooking into art and alchemy. The look, the feel, the presentation are given a weight even greater than taste in the the process–it’s much more about the experience of eating than the food, as opposed to someone like Thomas Keller, at The French Laundry, who focuses on the food first. After their creative sojourn, it’s time to move back to the restaurant and swing into the business season. A huge staff is assembled, everything is planned to the last tiny detail. If a 3 hour, 35 course meal is slowed by even 1 minute per course, it becomes a 3 1/2 hour meal and the entire operation backs up. Everything must be perfect when you are trying to maintain the reputation of world’s best. And when customers are spending staggering sums of money for tiny, one bite dishes that will never be repeated. Much of the last third of the movie consists of watching Adria as he sits in the kitchen and tries all of the dishes. Plate after plate after plate, as he makes makes notes on how to improve them and instructs the cooks on miniscule details. It wasn’t what you would call brilliant movie making, but it was an interesting look into the process of running a restaurant that is more shrine to technique that eating establishment. 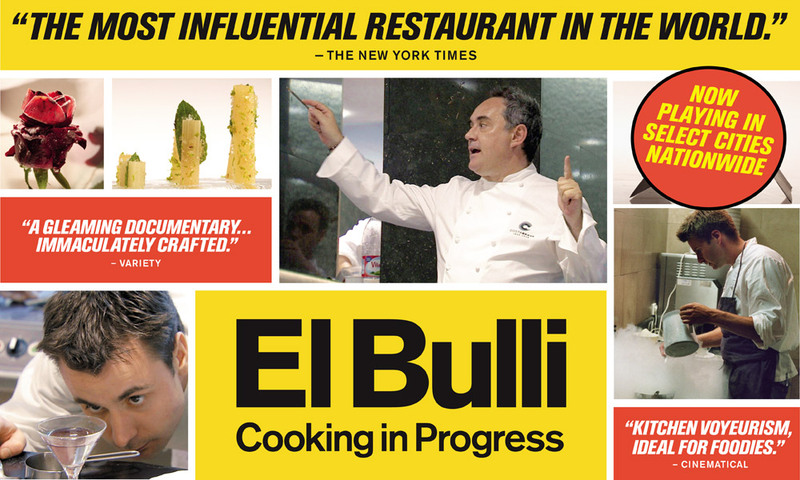 El Bulli is closed now. Ferran Adria is moving on to other things–teaching, writing, creating. There is a restaurant called Noma, in Copenhagen, which is currently considered the world’s best. It’s founder/chef formerly worked at El Bulli, and The French Laundry.